As the crisis along the borders between Morocco and the two Spanish enclaves of Sebta and Melilla started to hit the headlines around the world, the Moroccan civil society has finally decided to act. Moroccan human rights NGOs have expressed their solidarity with the sub-Saharan Africans who go through the mill on the country's northern coasts, frequently used as a springboard into Europe. The Moroccan Association for Human Rights (AMDH) and Espace Associatif staged a sit-in on Thursday in Rabat, calling on the Moroccan government and the European Union (EU) to refrain from the security measures they have intensified on their shared borders and respect the rights of the sub-Saharans aspiring to cross the borders in search of a better life. Dozens of human rights and peace activists took part in the demonstration, held at the Post Square, only a few metres from the Parliament in the capital's Mohammed V Avenue. “The Moroccan Association for Human Rights denounces the barbaric violence which led to the death and injury of many African migrants,” said an AMDH statement. “It condemns all the violations of human rights inflicted on our African brothers,” added the NGO's document, urging the Moroccan and Spanish authorities to open an immediate probe into the latest events that sparked a crisis on the two countries' shared borders, where thousands of sub-Saharan would-be migrants clash with police forces and frontier guards. In late September, Rabat and Madrid decided to deploy troops to the borders between Morocco and the two Spanish-controlled cities, after the substantial increase in the number of massive attempts to cross into Sebta and Melilla over the last two months. A number of migrants, mostly from sub-Saharan Africa, have died while storming the two enclaves by climbing their barbed-wire fences, in quest of a better lifestyle in the supposedly-eldorado EU countries, while many others have been reported injured. Morocco has been criticised for its handling of the latest stampedes led by the would-be migrants on the country's northern coasts, as many international NGOs laid the blame for the deteriorating situation on the Moroccan authorities. The government defended its use of force in restraining the huge numbers of migrants from crossing into Sebta and Melilla, the two Moroccan towns taken over by Spain more than five centuries ago. Earlier this week, the Minister of Communication and Spokesperson for the Government, Nabil Benabdallah, admitted that Moroccan troops caused “unavoidable humanitarian problems”, as the country was pressurised into stemming the mass attacks on the borders with the two enclaves. Morocco accuses neighbour Algeria of throwing the door wide open for sub-Saharan migrants, allowing them to cross into the Moroccan territory “without any surveillance.” The communication minister announced on Thursday that 90% of the sub-Saharan migrants transit through Algeria. The government also reiterated that European countries are under an obligation to exert more serious efforts if they are to reach a practical solution to curb the flow of African migration. Morocco was promised a 40-million-euro grant as part of an anti-illegal immigration programme, but the money is yet to be received, underscore government officials. Answering to the international community's increasing criticism, the Moroccan authorities rap some Spanish NGOs and political corps for “politicising the tragic events” taking place along the fences that cordon off the two enclaves from the rest of Morocco. The government has been facing mounting international pressure as it began to deport Africans who use the country's land as a gateway to Europe. 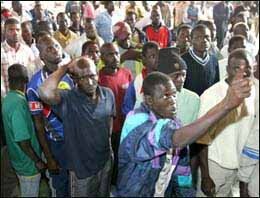 The first deportees included a group of 140 Senegalese, who were carried on a Royal Air Maroc flight last Monday from the north-eastern city of Oujda to Senegal's capital Dakar. Other mass deportation operations have followed over this week. International NGO Médecins Sans Frontières (MSF) accused Morocco of “abandoning the deported migrants in the country's south-eastern desert”, near the borders with Algeria, after Spain had sent them back to Morocco. But the Moroccan authorities denied these charges, affirming that the deportees “were well hosted and correctly treated.” The ones found in Morocco's southern desert “must be newly arrived refugees” who cross into the country through Algeria, maintain government officials. However, the Moroccan human rights groups side with MSF, urging all the parties concerned to provide the migrants with decent and human treatment. “We have staged this peaceful demonstration in outcry against the inhuman treatment of those decent-life seekers. The sub-Saharan Africans who get killed on the borders with Spain are only looking for their chance to uplift their living conditions and lead well-settled lives. They all come from very poor countries, and some of them flee civil wars. They are human beings, and deserve to be respected,” expounds Ben Abdeslam, who was among the sit-in organisers. Although Africa is rich in natural resources, mainly minerals and precious stones, half of the continent's population lives below the USD 1-per-day poverty line. With nearly 13% of the world's population, Africa enjoys barely 1% of the world's wealth. Recent figures show that 40% of the African population suffer from malnutrition and famine and two thirds of the black continent's land is degraded, with vast numbers of Africans living without adequate shelter, safe drinking water or sanitation, to say nothing of the tribal conflicts, civil wars and epidemics that have devastated many African nations. “We believe in the universality of human rights, and we strongly refuse that this concept be subject to Europe's double-standard policies,” underlines the AMDH activist. “Migration is an international phenomenon that has always existed. The current situation is the result of the unfair distribution of the world's wealth. It is the product of European imperialism. Now Europe's immigration countries have to assume their full responsibilities. But their approach should in no way be repressive. “The arguments advanced by Europe are contradictory to the international charters bearing on human rights. Individuals are free to look for other opportunities to ameliorate their social circumstances, and freedom of movement is an essential principle in the Universal Declaration of Human Rights. We do not want Morocco to be a frontier guard for Europeans,” emphasized Ben Abdeslam, calling to mind the European imperialistic history. “When Europe was in desperate need of manpower, it went in search of African muscles inside the continent. But now it asks North Africans to guard European borders by hindering their sub-Saharan brothers from crossing. We can't accept that,” he concluded. The Moroccan NGO Espace Associatif urged the governments of the region to adopt a broad and more realistic approach to the crisis. “Reaffirming our categorical rejection of our government's involvement as a policeman or warden for European borders, we call for the authorities in Spain, Algeria, Mauritania and Europe to fully respect the international humanitarian law and all the international charters relating to human rights, and to adopt a comprehensive humanitarian and solidarity-based strategy to face this calamity, which European countries are to a large extent responsible for,” said a statement released by the organisation's executive office. The Rabat-based group also arraigns some Moroccan and international media for holding racist views against the sub-Saharans who use Morocco as a transit point to sneak into the old continent. “We call on all the people who praise the values of justice, solidarity and respect of human rights... to relentlessly repel the racist tendencies of some media, as well as oppose the so-called security measures adopted by the public authorities,” the release went on. Protestors observed a one-minute silence in memory of the sub-Saharans killed on the borders. “It is really a sad moment,” mourned a Morocco-based Congolese, apparently the sole sub-Saharan who joined in the demonstration. “I came here to pay tribute to those who lost their lives in Morocco while trying to look for a brighter future in Europe,” he said, drawing attention to the absence of sub-Saharans in the sit-in. The feeling of fear was confirmed by a 24-year-old Liberian, who was wandering in Rabat's Medina (old town) only a few minutes after the demonstration. “I can't express myself because I have no legal documents,” Samson told Morocco Times. “I came here with a dream, but now I'm looking for money to go back home. I'm scared of going to Spain. I don't want to get killed. All I want is to lead a normal life,” he screamed out with overwhelming distress, recalling the shattered hopes of his compatriots and other sub-Saharans on Morocco's northern coasts.